Template Inheritance is an extremely useful technique for making reusable HTML layouts for a site. It is much more flexible than alternative techniques, such as “including” common elements of a page (like a header and footer file). The concept has been around for a while, most notably in the Django template engine. 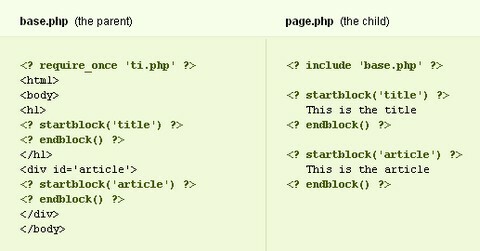 Unlike other libraries, PHP Template Inheritance lets you write everything in straight PHP. There is no need to learn another template language. It involves two separate templates, each in their own file: the parent template and the child template. The parent contains the HTML skeleton and markers for where content should go. These markers are calledblocks. The child then “fills-in” the blocks with content. Finally PHP re-invented the wheel or something all other use for ages – like masterpages ASP.NET. Good job guys! Now if you separate code from html/design to end this “spaghetti” madness… and eventually get rid of the $ in front of every variable it would be awesome. Unless you really want to see more dollars in your code. Lol, more dollars… PHP rules the web developer world! Nick: Smarty has separated code from design for a long time. Not only that, but Smarty has inheritance built into version 3.0. I was thinking about using Smarty, but in my project is not that big. this is really handy. Yes, Smarty does separate code from design, but you do need to learn the template language. It is “too big” for a simple task. Nothing short of awesome, but way too bloated for small timers. I’m giving PHPTI a go.